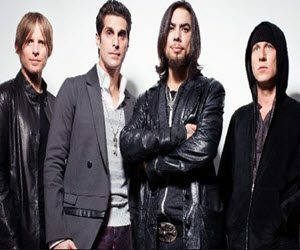 Jane’s Addiction is an American Alternative Rock Ensemble that originates from Los Angeles, California. They were formed as a unit back in 1985 and consist of some of the most famous rock musicians in the world. Dave Navarro, Perry Farrell, Stephen Perkins and Chris Chaney are all a part of this band. It was originally founded by Eric Avery, the original bass guitarist of the band and Perry Farrell. It wasn’t until a few years later where the two-man ensemble would meet the rest of the band to form the full ensemble. They were one of the first bands behind the early 1990’s alternative rock movement. They gained both commercial success and media attention that allowed for them to grow into an overnight sensation in the United States & Canada. Both of their first two albums which are named Nothing’s Shocking & Ritual De Lo Habitual received critical acclaim from just not the fans but also from reviewers as well. It seems that everything in the band’s future was golden but in 1991 they announced their farewell tour. The last event they held was the very first Lollapalooza which ended their farewell tour. The band briefly came back together in 1997 as an ensemble with Flea from the Red Hot Chilli Peppers working as the bass guitarist. It wasn’t until 2003 that they would release their third major album which was called Strays. After they toured for this album the band would dissolve again. Five years later the band once again reunited and stayed together for a number of years and is still together working hard on new music. Their fourth studio album was “The Great Escape” in 2011. Since then the band hasn’t released any new albums but they are still frequent with live shows, they even released a live album in 2013 but that doesn’t count as the same songs were played over again but this time only live. This year for 2016 the band will be holding a six show tour across the United States of America to celebrate the 25th Anniversary of Ritual De Lo Habitual & Lollapalooza. There are said to be some unknown special guests that will apparently shock the entire audience. Other than that the band members have begun whispers that they’ve collected a variety of new songs and that it could make a new album. This has lead fans to believe a new album will be released at some point next year. Overall, Jane’s Addiction was one of the originating acts behind alternative rock & metal. They are credited with the mainstream exposure of the genre for the 1990’s and still to this day they are one of the most popular bands in the world. Their popularity is so vast that they were nominated for the rock n’ roll hall of fame & could be inducted in the coming years. This would embody the band as one of the greats for the rest of the genre’s lifespan.